The redecorating of the East face of the signal box is now complete. Now we move on to the South face, which is in need of a lot of TLC. This face will definitely require stripping prior to priming. 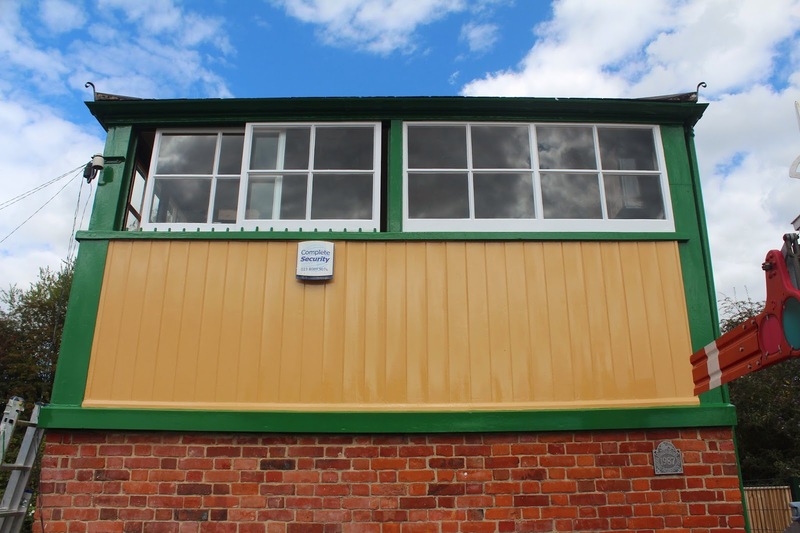 The redecoration of the east face of the signal box is progressing well. By the end of the August first Sunday of the month "working" day we were well on track for finishing this face. The tongue and groove boarding had received it's flexible filler (having previously received wood filler where required) and was undercoated. The windows have been undercoated after more filling in where required. This is no mean feat as there is so much "cutting in" due to all those panes of glass. Well done Keith! This side of the box will quickly start to look as it should now. It's all the preparation that takes the time. and the white primer on the boarding has almost been covered with undercoat. We were a bit thin on the ground with volunteers this month. Only myself, Keith and young Tom turned up. Keith and I battled on with the decorating while Tom cut the grass and did a lot of trimming etc. Thanks Tom. Hopefully the next redec report will have a photo showing this side of the box in it's proper colours.